Mercury was spotted for the third time this month in the morning twilight of August 22, 2012, at the defunct Pennsauken Mart site in New Jersey. Like most of the “clear” mornings this August, there were clouds present along the eastern horizon before sunrise, making it difficult to spot Mercury, which is at 8° altitude near the center of this image captured at 5:39 am EDT (40 minutes before sunrise). Move your mouse cursor over the image to see a 25% crop of the original centered on Mercury. Taken with a Canon 40D digital SLR camera (on a fixed tripod) and a Sigma 18-50 mm f/2.8 zoom lens set to 50 mm focal length; exposed 1 second at f/4, ISO 800, daylight color balance. In the morning twilight of July 5, 2012, brilliant Venus was 5° below bright Jupiter (about 0.2° farther apart than they were at their appulse on June 30th; they don't reach conjunction during this western elongation of Venus). First magnitude Aldebaran, the brightest star in Taurus the Bull, is just above the treetop below Venus. At 4:45 am EDT, about 53 minutes before sunrise, a magnitude -6 Iridium satellite flare appeared briefly near the two planets, about 20° high towards the east (in the upper right-hand corner of the image). Taken from Maple Shade, NJ, with a Canon 40D digital SLR camera and a Canon 70-200 mm f/2.8L zoom lens (on a fixed tripod) set to 70 mm focal length. Exposed 8 seconds at f/8, ISO 400. Mouseover for labels. On June 27, 2012, brilliant Venus is 5° below bright Jupiter (mouseover to see labels), and both were prominently visible to the unaided eye during morning twilight. It's been three weeks since Venus transited the sun, and she now has reached a solar elongation of 29° west, placing her in the unseen Hyades star cluster, which marks the face of Taurus the Bull. Taken at 4:51 am EDT (42 minutes before sunrise) from the old Pennsauken Mart site in New Jersey with a Canon 40D digital SLR camera (on a fixed tripod) and a Sigma 18-50 mm f/2.8 zoom lens set to 33 mm focal length. Exposed 1/2 second at f/5.6, ISO 400. Here's the view 20 minutes earlier, at 4:31 am. The Pleiades star cluster, marking the shoulder of Taurus the Bull, is near the top of the frame, Jupiter is 6° below the Pleiades and Venus is 5° below Jupiter (mouseover to see labels). First magnitude Aldebaran (Alpha Tauri) is in the cloud about 3 degrees below Venus. Same camera but using a Canon 70-200 f/2.8L zoom lens (on a fixed tripod) set to 70 mm focal length. Exposed 2 seconds at f/4, ISO 400. The sun is about to set on June 20, 2012, as viewed across the mouth of the Maurice River at East Point, NJ, on the northeastern shore of the Delaware Bay. This picture was taken at 8:24 pm EDT, 5 minutes before sunset at 8:29 pm and 75 minutes after the solstice at 7:09 pm, with a Canon 40D digital SLR camera and a Canon 70-200 mm f/2.8L zoom lens set to 200 mm focal length. Exposed 1/500 second at f/4, ISO 400 (handheld). I was hoping to spot the 34-hour-old crescent moon after sunset as a follow-up to Monday morning's old crescent moon sighting (see below), but the generally hazy sky and murky horizon precluded it. Here's the East Point Lighthouse at 8:16 pm, in the direction opposite the setting sun. Taken with a Canon 40D digital SLR camera and a Canon 70-200 mm f/2.8L zoom lens set to 80 mm focal length. Exposed 1/250 second at f/4.5, ISO 400. This is the view at 4:56 am EDT, 35 minutes before sunrise on June 18, 2012, from the old Pennsauken Mart site in NJ. The bright dot in the upper-right-hand corner is Venus, now easily visible to the unaided eye 13 days after inferior conjunction and the Transit of Venus on June 5th. Not so obvious is the 28.38-day-old moon in the lower left. It's just 30 hours 6 minutes before new moon, which will be on June 19th at 11:02 am EDT (move your mouse cursor over the picture to see it in a close-up crop). The sublimely thin crescent was distinctly visible with carefully aimed binoculars (followed until 5:15 am), but it was unseen with the unaided eye. At the time, the moon had a 13.5° solar elongation, nearly twice the Danjon Limit; however, the ecliptic was tilted only 40° to the horizon and the moon had an ecliptic latitude of -1.5°, so the elongation didn't translate into much altitude (only about 1.5° at 4:56 am). This picture was taken with a Canon 40D digital SLR camera and a Canon 70-200 mm f/2.8L zoom lens (on a fixed tripod) set to 150 mm focal length. Exposed 1/15 second at f/4, ISO 400. Besides size reduction and cropping, no processing was applied. Here's another frame taken at 4:59 am EDT using 200 mm focal length (then cropped) with the contrast enhanced. 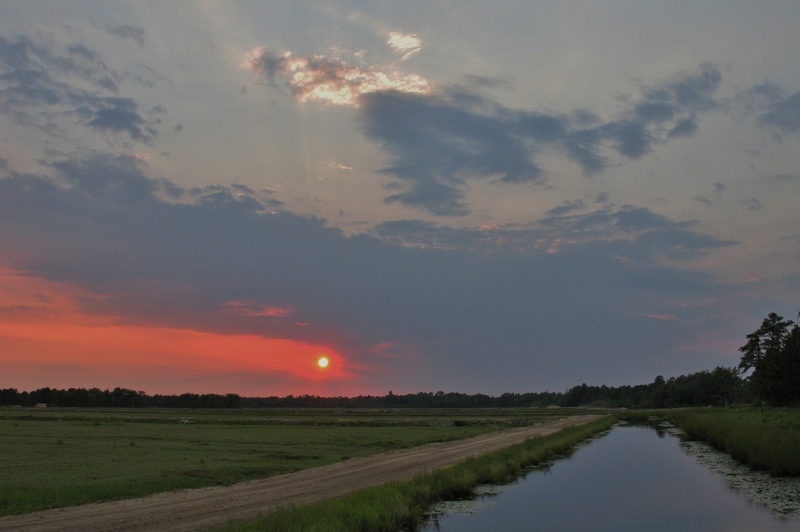 At 8:04 pm EDT on June 10, 2012, the sun was 3° above the horizon, not long before it set at Whitesbog, NJ. Mercury, unseen in this picture 16° to the upper left of the sun, was spotted with binoculars at 8:50 pm, 24 minutes after sunset. Taken with a Canon PowerShot G6 point-and-shoot camera set to the minimum 7.2 mm focal length; exposed 1/200 second at f/4, ISO 100. On June 2, 2012, Venus and Mercury were spotted from the southeastern corner of the Lee Brothers commercial cranberry bog on Rt 563 in Speedwell, NJ, using 16x70 Fujinon binoculars, seen here on their Light Speed mount atop a Manfrotto tripod. They're aimed at a nominal 300 degrees azimuth on the distant tree line, which is only about 2 degrees high in the direction of interest (towards the sun, Venus and Mercury). This picture was taken at 8:20 pm EDT, one minute before sunset, with a Canon 40D digital SLR camera and a Sigma 18-50 mm f/2.8 zoom lens set to 18 mm focal length; exposed 1/50 second at f/5.6, ISO 400 (handheld). Using the binoculars, the thin crescent Venus (0.4% illuminated) was spotted at 8:09:50 pm (5.5 degrees altitude), just after the sun had disappeared behind the trees. Mercury was spotted at 8:17:30 pm (7 degrees altitude), so both were technically seen during daylight. Neither planet was seen with unaided eyes. Venus disappeared behind the trees at 8:32 pm and Mercury disappeared at 8:49 pm. At the tree line, Venus had a solar elongation of 4° 51' and Mercury had an elongation of 8° 08' (so they were little more than 3 degrees apart, but their relative positions were reversed compared to the May 31st sighting described below). Unfortunately, it was cloudy on June 1st when they were just 1/2 degree apart. Venus will be at inferior conjunction on June 5th (during the Transit) and Mercury was at superior conjunction on May 27th. Update, June 8, 2012: After failing to spot Venus during the Transit (because of cloudy weather), and then at sunrise on the mornings of June 6, 7 and 8 (at the old Pennsauken Mart site), I was finally able to spot it at 11:58 am on June 8th from my backyard with 16x70 binoculars. Using the corner of my house's roof to block the sun, and ignoring a number of windborne seeds ("pappi") that glow brightly near the sun, the crescent Venus was plainly visible at a solar elongation of 4 degrees 10 minutes (0.3% illuminated, 57.6 arc seconds diameter and 70 degrees altitude). It was similarly spotted again at 12:27 pm on June 10th. Update, June 15, 2012: At last, some clear sky along the eastern horizon at sunrise. I arrived at the Pennsauken Mart site at 4:45 am (the time of Venus' rising). Jupiter was already visible with unaided eyes (the first time since solar conjunction on May 13th; it had been seen with binoculars on June 6th). At 4:50 am, Venus was spotted with 16x70 binoculars as a distorted blob about two-thirds of a degree altitude. At 4:55 am, it was detected with unaided eyes (at 1.5 degrees altitude), and was now a thin crescent (about 4% illuminated) in the binoculars. So, there was a 6-day span (from June 2 to June 8) when Venus was unseen at all, and a 16-day span (from May 30 to June 15) when it was unseen with unaided eyes. On May 31, 2012, Venus was spotted with binoculars at sunset (8:22 pm EDT), and then with unaided eyes at 8:42 pm, from the Swede Run Green Acres site in Moorestown, NJ. In this picture, taken at 8:41 pm, Venus was about 3 degrees altitude, the bright dot to the left of the nest of antennae atop the water tower (mouseover to highlight). As Venus nears the sun and the Transit of Venus in five days, the solar elongation has dropped to 8 degrees, the diameter has grown to 57.0 arc seconds and it has narrowed to a 1.0% illuminated crescent. Nevertheless, it remains relatively bright at magnitude -4.1. Mercury was also spotted (with binoculars) at 8:35 pm, but it did not register in any of the photographs (it was a couple of degrees lower than Venus and dimmer at magnitude -1.8). This image is a single frame taken with a Canon 40D DSLR camera and a Canon 70-200 mm f/2.8L zoom lens (on a fixed tripod) set to 200 mm, then cropped to two-thirds its original size (so the frame is about 4.2° wide × 2.8° high). Exposed 1/30 second at f/5.6, ISO 400. When this image was captured at 8:50 pm EDT on May 16, 2012 (from Delran, NJ), Venus was becoming a slim crescent (12.0% illuminated) that has grown to 48.3 arc seconds diameter. Venus is rapidly losing altitude after sunset now, and it's less than three weeks until it transits the sun. This image is a single frame taken with a Canon 40D DSLR camera and a William Optics 80 mm, f/6 Megrez apo refractor on a fixed tripod. Exposed 1/350 second at ISO 800. Magnified by cropping to about 10% of the original size.